Hello, world! I still exist. Last month was absolutely nuts with traveling, housesitting, visitors, and a cold, so I’m just now getting my feet back under me. But before I went off to Colorado for a writers’ conference I got to do another indigo vat! And if there’s anything scarier than doing a natural dyeing pot, it’s doing it for the second time. Because things can go differently. And this second pot of indigo decided to change whatever could be changed. The indigo didn’t dissolve as nicely, the bloom took longer in forming, and the actual vat decided to get oxygen in it a couple times. I tell you. It was crazy. Well, it still behaved fairly well. Although it seemed a lot stronger than I’d planned. I wound up with a nice medium chunk of fleece. Every single scrap of Iowa fleece I have left (except for one chunk that had lots of VM) has been pre-soaked twice. All of it. Excuse me while I go collapse. I spent I don’t know how long outside in the backyard hauling pots of water, wrestling fleece, spinning out the excess water, and shooing away any curious insects. It wiped me out. I have this feeling that the neighbors think I’m some sort of odd person — constantly lugging pots out there, whirling around spraying water in every direction — yeah. Well, if they want some wool they can have it. I just want to get it all washed by the second of August. Why the reason for this sudden haste? A certain special friend is coming to visit next month, and she’s bringing a toy with her. Something very beneficial for those who have lots of fiber to process. Any guesses? I have one whole sock now. It’s quite comfy, but a little baggy around the toes. It’s quite possible that I knit it a size too large. And the second sock is visible. I’m about an inch into it. All the indigo dyed fiber is carded up and turned into roving. Look! Look at that. I almost have the entire foot covered in stripy material. Whoo-hoo! I took it along to work, and the best part was a small friend’s conversation with me while babysitting. Anyway, it’s currently giving a great impression of a hobo’s sock, and if I can just figure out where the pattern went I can finish it up and knit the second one. It’s been long enough since I started the first one that I’m not worried about the second being the same old same old. Definitely a bonus. Prepare to feast your eyes on the myriad of blue shades I got out of the indigo pot. Gorgeous! This is the skein of heavy worsted I spun on the drop spindle. I have no idea what I’m going to do with it, which is unfortunate because I love the color. I dunked it in the dye only once, so it’s relatively light in color and actually has a little variegation going on. 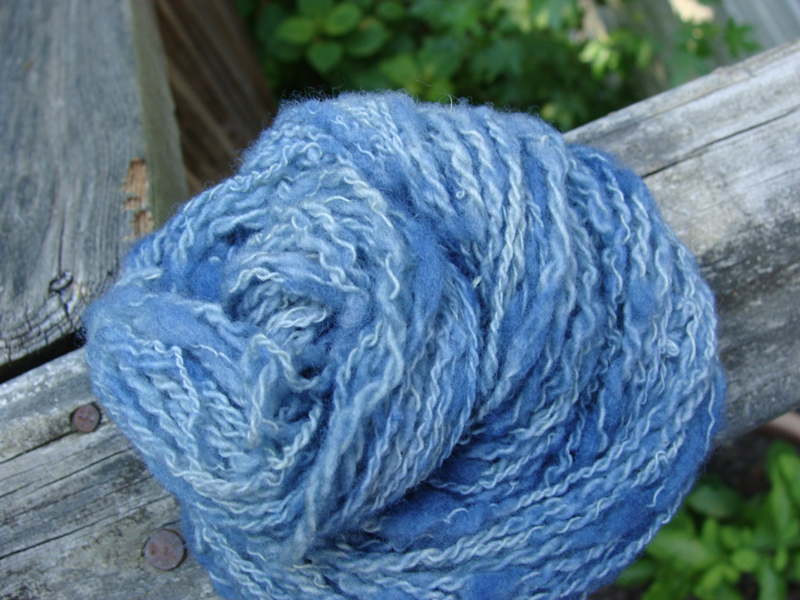 Here is another skein that I dunked three or four times. I think three. It’s one of the three Iowa fleece skeins I spun on the Walking Wheel. So, I finally broke down and did it. I couldn’t stand waiting any longer. It kept calling and calling. I had to give it a try. Allow me to introduce to you, indigo. What you see before you is real. And very, very blue. The recipe I was given at the Handspinner’s Guild worked wonderfully after a minor delay. Something wasn’t happening as fast as I thought it would, so I did a little research and found out that you’re supposed to leave the lid on to speed things up in the preheat. I’ll have to do some digging to find out if I can legally share that recipe with you. It’s great. I’ve started the races on wool washing. As of now I have a pretty good start. I’m being extra careful to not let the wool sit and be forgotten for too long, as that seems to make the final fiber coarser. I have a finished batch drying, another in the degrease stage, and a third in the preliminary soaking. In the meantime, quick, take a guess. What new knitting project have I plunged into? Anyone? Anyone? It is not a garden hose cozy. I haven’t quite gone off the deep end yet. I am merely dipping my toe in the water, so to speak. (Although I’m not doing it the toe-up way.) Behold the beginnings of a sock. And before you start pointing out that the yarn isn’t one of mine, let me explain. 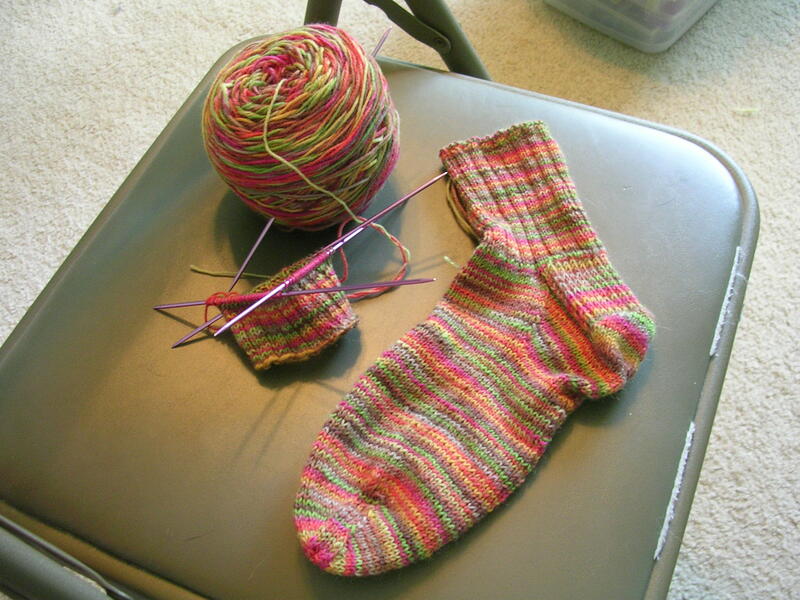 I was going to try to knit my first socks out of handspun, but the only handspun yarn I had was too thick. My knitting sister very kindly shared from her stash, so while you see before you a completely commercial yarn, it is still a nice yarn. Could I have waited to spin my own? Of course not! When you have the urge, you knit. Last Sunday I got to go to a wonderful Renaissance Faire which is held near the place I reside. In summary: it was absolutely fabulous. In fact, I’ll break tradition and show you a non-spinning-related picture. Here’s the costume I wore. 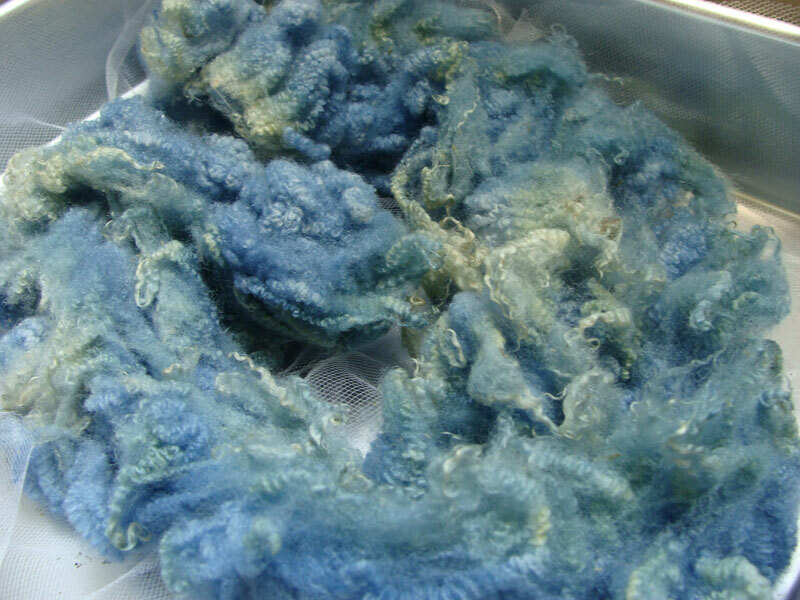 Actually, it turned out to be partially spinning-related because I made a felted pouch and belt to go with it. Believe it or not, the brown yarn I used was actually spun from some of the very first fiber I ever ordered online. My second ever fiber purchase. Ah, the memories. (I’ll get you some details on the belt and bag tomorrow.) 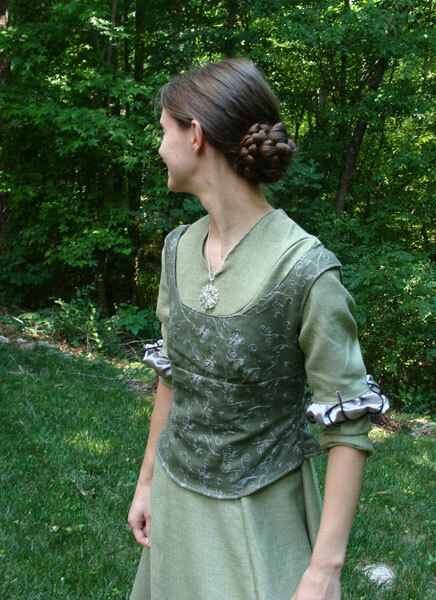 The dress turned out just right. Not too hot, even though the sun was popping in and out of the clouds all day. The Handspinning guild I went to late last year was there! And the wonderful lady who gave the talk on natural dyeing was doing an indigo pot. Wow. The colors she had sitting beside her. . . I think I’m going to faint. Gorgeous blues and blue-greens. Unfortunately I wasn’t able to actually hang around and watch her work, but we talked natural dyes for awhile. At the guild meeting she had mentioned getting things like goldenrod leaves at a shop at the Ren faire, so I decided to poke around and see if I could find it. I did, with the help of some friends, and here’s the result. A nice little bag of dried goldenrod leaves. I really wish I had summoned up the courage to ask the shop keeper if she had any other natural dye stuffs. Fie upon me for a cowardly spinner. “Oh, I could write a sonnet about my Easter soysilk. . .” Wait a minute. That doesn’t rhyme. Well too bad for the song because this soysilk is the coolest thing since sliced bread. It’s a bit of a challenge to spin up because it’s clingy like silk, but it falls apart easily. Explain that one. I’ll be holding a chunk of roving and blop—half of it falls to the floor. And the other half sticks to my shirt and jeans. But I learned its wily ways fast! The first bundle of the huge fleece is out of the wash pot and drying. The sheer size of the remaining fleece is slowly dawning on me. That’s a lot of carding time! And even though I enjoy carding, there is a limit to what my hands can do without becoming one giant blister. I’ve thought about getting a drum carder, and I know which kind I would get, but they’re a bit—no, very—pricey, and I don’t want to lay out that sort of money unless I’ll be using it to generate more income. Like custom batts or something. To put things in perspective, I could buy my spinning wheel three times over with that much money. So, for the time being, I’ll keep hand carding.